Location: Outside Brodick, Arran, Scotland. Notes: Brodick Castle is a castle situated outside the port of Brodick on the Isle of Arran, an island in the Firth of Clyde, Scotland. It was previously a seat of the Dukes of Hamilton, but is now owned by the National Trust for Scotland. The Castle and gardens were acquired by the National Trust for Scotland from the Lady Jean Fforde in 1958, in lieu of death duties upon the death of her mother, the Dowager Duchess of Montrose. 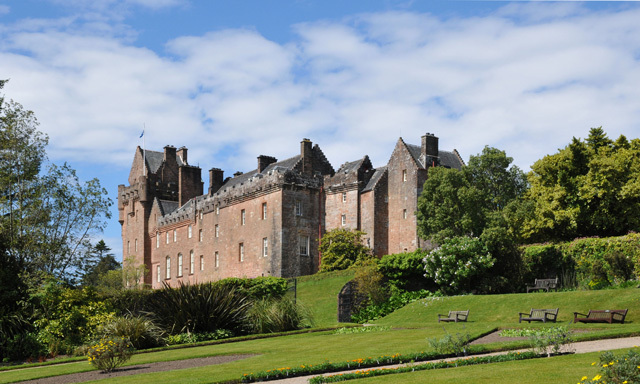 The castle is open to the public during the summer, with Brodick Country Park open all year round. A black and white copy of William Woollett's engraving of The Death of General Wolfe by Benjamin West can be seen at the castle. Since 1987, an illustration of the castle has featured on the reverse side of twenty pound notes issued by the Royal Bank of Scotland. The 1998 film The Governess, starring Minnie Driver, was filmed at Brodick Castle.